RecipeTips.com's video demonstration, 'How to Remove Excess Moisture from Summer Squash,' describes how to remove the water from squash. Hi there! This is Laurie from RecipeTips.com. Today, I am going to show you how to draw some of the water out of a summer squash. To start, you are just going to want to take a knife and slice down the center lengthwise of your summer squash. Now, it is going to expose the seeds. Then it is just really easy. You take the spoon and you just remove the seeds. It is not important to get all the seeds, but you want to get some of them out of there. Go ahead and sprinkle the summer squash with ample amount of salt. This is going to draw the water out of the summer squash. When you are baking and frying and grilling summer squash, sometimes it gets a little mushy because of the excess water, so this step really helps that. Once you have the salt on, go ahead and flip the squash over; the paper towels are going to absorb all that water that it releases. Let these sit for approximately thirty minutes. 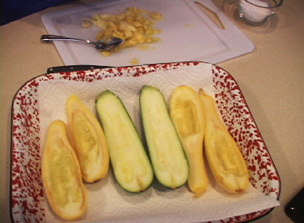 After thirty minutes, you will notice that the paper towels have absorbed a lot of the water from the summer squash. Go ahead and rinse these off under cool water just to remove some of the salt; you don't have to worry about getting it all off, but after that, they are ready to cook. For more information on summer squash, visit RecipeTips.com.